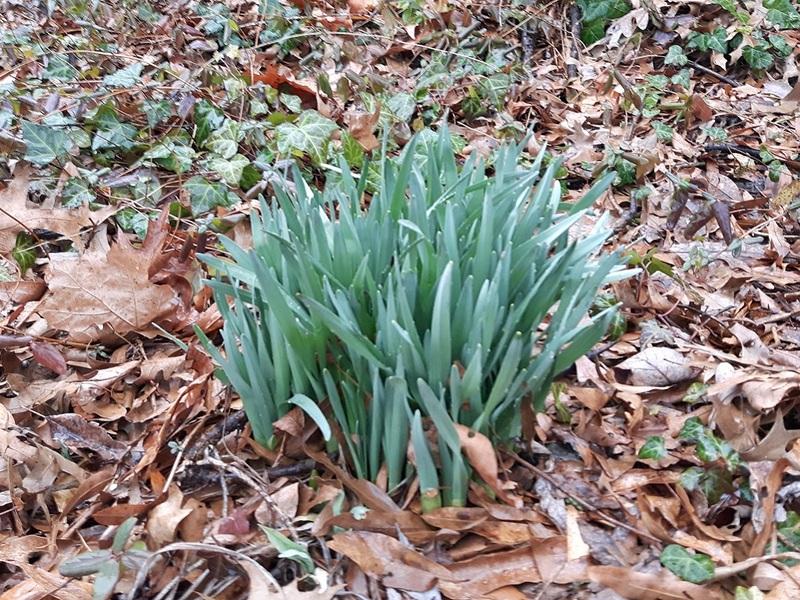 Anyway, early this month, after the snow cleared away, I saw something that gave me hope that the end of the really cold temperatures is already in sight: daffodils. They usually bloom by Saint David’s Day (March 1st), so we haven’t too much longer to wait. Our first outing in February was in Reston, where we took a 5-mile hike along the paved paths winding through the woods around Lakes Audubon and Thoreau. I’m not overly thrilled with paved paths, but in a melting snow/slush situation they have their advantages. (See the bit about getting dressed for the hike above.) There were quite a few birds darting through the woods, and a couple of pileated woodpeckers made an appearance, but they were too wary of our large group to stop and pose. Towards the end of the hike, though, we were rewarded by encountering a small herd of deer. The few does who had been nervously nibbling on bushes showed us a clean pair of heels but the buck with them defiantly stood his ground while they escaped. Good for him! The next day we visited the Smithsonian National Zoological Park, and winter can be a good time to go if you don’t mind the cold. There’s no crowds and most the animals are still out, so you don’t have to elbow your way in to get a look. An added attraction just now is that Bei-Bei, the newest Panda, made its public debut on January 16. Of course, as a structured walk/hike, a group visit to the zoo falls apart almost before it gets started, because everyone wants to linger longer to check out their favorite animals. But regardless, it still winds up being a respectable hike: one circuit around the park is 3.5 miles, assuming you don’t double back much, and you have another mile to walk to and from the nearest Metro stop. Last weekend we got in a short 4-mile hike around Old Town Alexandria, and the 21oF temperatures with 10-20 mph gusting winds made for a very fast morning. After that, another heavy snowfall forced cancellation of a planned outing to Mount Vernon to celebrate George Washington’s birthday, but at least we have another shot at it on February 22nd. I’ve been wanting to visit Ox Hill/Chantilly Battlefield for some time, but it’s very tiny — most of the battlefield was bulldozed down in the mid-1980s to make room for condominiums. The roughly five acres left doesn’t make for much of a trip, and there’s only room for four cars in the parking lot. (The regrettable loss did make it the poster child for future Civil War battlefield preservation efforts, though.) But during a hike at last July at Walney Farm and Big Rocky Run I drove by a good starting point at Greenbriar Park, with plenty of parking and a pleasant 5-mile hike to and from the battlefield along Rocky Run Stream Valley Trail. We’re doing the hike this Saturday, and you can read about the hike and the battle here, but I went there today to snoop around and see what’s cooking. This entry was posted in Hiking, Photography and tagged cardinal, Chantilly Battlefield, Civil War, Lake Audubon, nature, Ox Hill Battlefield, Red-Shouldered Hawk, Rocky Run, Smithsonian National Zoological Park, wildlife. Bookmark the permalink.